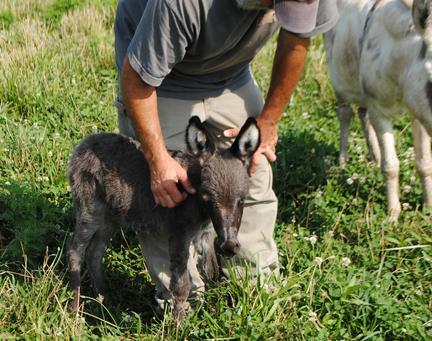 We have just a few Miniature Donkeys. I love the unusual colors. 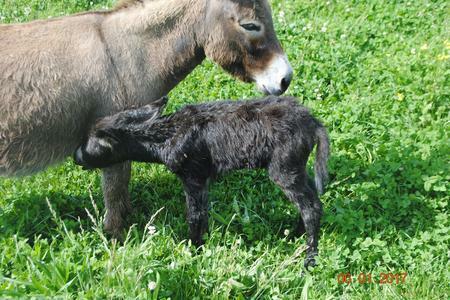 Gray with a light colored nose is the normal donkey color. Anything else is more recessive in color and some are very hard colors to get. We have some with spots, and dark brown, very different from the typical gray, plus a black who is really cute. 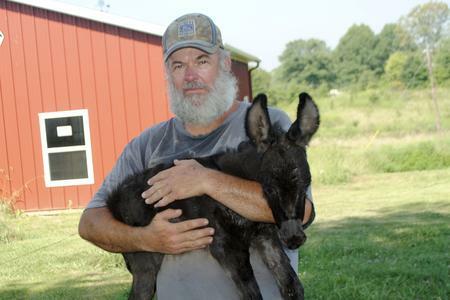 We adopted donkeys originally when we seen a coyote in the barn trying to get our chickens. I didn’t want a standard donkey because they can be very dog aggressive, even to dogs they know. We got busy (2015) when the issues all started with needing to get my mom and aunt moved to a place with more supervision. So busy we didn’t get the 2 babies born sold then. 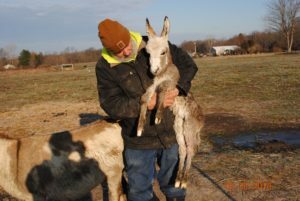 This year we have decided as much as we love them we can’t keep up the way we want so we have sold one mom, Sister Sarah, who has a baby every year, with her new gray jenny foal at side to a terrific home. The same family also bought the spotted yearling jack. We will have less to care for. We still have 3 adult jenny’s, (moms,) and 2 adult jacks (dads.) One of the other jenny’s just had a foal (2016). The other 2 wont foal until next year since we kept them separate from the jacks. ​Photos are all 2016. I’ll have to search for past photos. I put a couple with the Nubian goats for a size reference. They happen to be yearling goats and all girls which aren’t full grown. The big goats are taller at the shoulder then the mini donkeys, and the buck goat makes the mini horse and the mini donkeys look small! New posts at the bottom of the page. 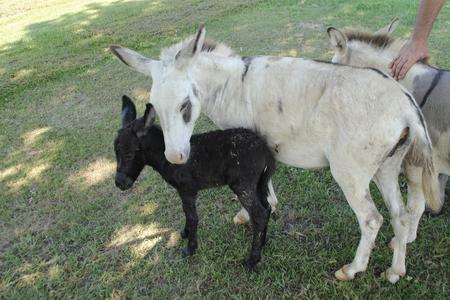 Martha and Billy Jack had a foal 8-11-16, a black jack, like his daddy. He is our second foal for 2016. We only had the 2 jenny’s with Billy Jack (our tiny black jack) last year. The foal has a deposit on him and will go to his new home with Gypsy Vanner horses when he’s weaned. First baby of 2016. Gray, dark face, Jenny foal born 7-19-16. We sold her and her mom together with the spotted yearling jack. Both mom and baby are totally unrelated to the yearling and the family want to have more foals in the future. Sad to see them go, but we have a bit too much on our plate with all that has happened over the last year! You can see the new red morton building in the background that is the little house we are finishing for my mom and aunt. 2017 Martha had a spotted jack foal. I cant remember but I think Billy Jack is the sire. 2017 Truffles, our brown donkey had a really dark jenny. I don’t think she is quite black on 6-1-17. 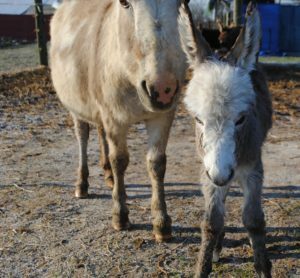 2018, Ceirra had a new baby girl adorable gray and white born 3-22-18. It was a cold day, Art went out and found her already up and nursing. Good thing they are tough babies. Art hadn’t noticed Ceirra was getting really close. A coulee weeks earlier I pointed out she was started to bag up. I miss being outside with all the critters all the time, and needing to rely on someone else to be observant. Puppies random photos and stories!